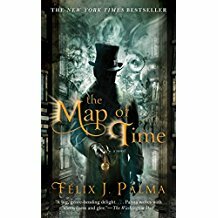 This was supposed to be a review of The Map of Time, by Felix J. Palma, a book of 609 pages. Instead, it is a review of the first 85 pages because I am going to bail, give up, leave; because life is short and Time is precious. Mind you, there is some quality in this book. If it were irremediably terrible, I wouldn’t waste a post on it. Heinlein did time travel, often and occasionally well. Let me retrodict (retrodict: neologism, the opposite of predict) how Heinlein would have written the first 85 pages of this story in, say, 1955. A___ stood over the torn body of his lover, heartbroken, feeling that his life was over. Then C___, his cousin said, “You can fix this. Just go back in time and kill her killer before he can kill her. That, folks, is the entire thrust of the fist 85 pages of The Map of Time. And that’s not all. We already knew exactly what was going to happen by the second or third page. How? Because Palma spends most of his pages foreshadowing events. And, since he calls in every cliché known to Victorian England — Jack the Ripper, ruthless rich father, cowardly wimp of an heir, H. G . Wells and his Time Machine, a hero who thinks he is sensitive but is actually just a clod chasing whores in Whitechapel — we know from the start where this story is going. The only surprise along the way is that there wasn’t one single surprise along the way. The writing style is Victorian appropriate. The “hero” never becomes quite so bad that we don’t think he might be salvaged. The “Dear Reader” asides are cleverly handled. The description of London carries the story well. These are all the reasons I stayed around as long as I did. I thought it might get better. I thought something would eventually reward me for my perseverance. No luck. I’m out of here. Did I leave just before the story got good? I’ll never know. If you stuck with The Map of Time all the way through, and you think I’m wrong, tell me. But, spoiler alert, I’ll be hard to convince. This entry was posted in A Writing Life and tagged fantasy fiction, literature, review, science fiction, time travel, writing on October 23, 2017 by sydlogsdon.